Looking for that final touch to your lodge cabin motif, then look no further than these rustic shades. These lamp shades are a perfect fit for your antler lighting and are handcrafted in several sizes on handmade papers in a rustic, western and lodge theme. All of the lampshades are laced with suede lace and have antler buttons. Shades can be made with a wide selection of wild life, western and southwest stencils. 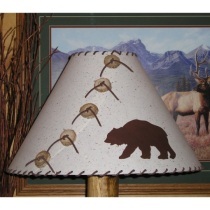 The Sagebrush lamp shade is shown with dark brown lace, and a bear stencil.